#ChangeBeginsWithChains? Can Hungry Nigerians Change While Cabal Get Billions And President Keeps Fleet? 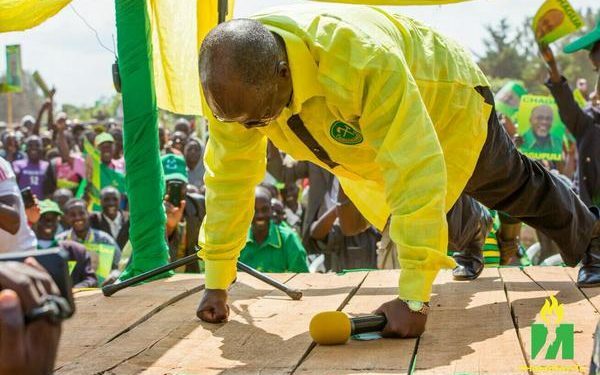 When Tanzanian president John Magufuli got down on stage to do push-ups to woo voters, few appreciated how serious he was about getting down running. Elected into office last October, Mr. Magufuli quickly earned the nickname, “Bulldozer” for sweeping reforms of the chronically corrupt system and for his personal and administrative sacrifices. Upon assumption of office, Magufuli quickly began personally vetting and banned all unnecessary foreign trips. He cancelled the independence day celebrations which he converted to a day of cleaning in which he personally participated. His body language forced corrupt government hospitals that used to divert patients, to instantly turn on functioning hitherto abandoned machines and resume proper services. The Bulldozer has been so bent on cutting government expenditure and “waste,” he even slashed government extras like the serving of tea and coffee. A one in a kind leader, Mr. Magufuli has been said to sneak around incognito to personally discover infractions. Tanzania’s Bulldozer was so enigmatic that within his first months he inspired a viral citizen social media campaign: “What will Magufuli Do?” Tanzanians decided to straighten-up, tighten their belts and be more disciplined, orderly and prudent in cognizance of the example of Magufuli the Bulldozer. While Nigeria has a new president who is radically different from his predecessor, unlike Tanzania where a public change campaign was inspired by example, the Nigerian government decided to launch its tailored campaign to force “reform” of the people. Change Begins With Who? Which Me? Last week Thursday president Muhammadu Buhari, PMB came out to launch the “Change Begins With Me” campaign. People quickly remarked that the “me” appeared to mean “you.”Counter campaigns like, “Change Begins With PMB” immediately sprung up. While Buhari and his vice slashed their salaries upon assuming office and like Magufuli, slightly trimmed his ministerial cabinet, the people appear not to be convinced the president has done enough. With the launch of the self-change campaign in a nation in frank recession with untold deadly hardship permeating the land, the frustrated people appeared to be encouraged to shut up and fix something in their vicinity or about themselves rather than look to the Buhari administration to rain down the “change” promised. It’s really hard times in Nigeria. 4.6 million citizens have lost their jobs under the first year and half of the Buhari new government. This loss of income comes at a time when the pump price of fuel has been hiked almost 70% and the “Naira” state currency value has dropped to somewhere around 400 to a dollar, a 260% depreciation in value. There is no social welfare system in Nigeria. Food is scarce as is hope. But what is more frustrating is that while the current Buhari government is not alone in mismanaging the economy into its current collapse, the president has not been seen doing enough to curb waste in his cabinet and the siphoning of government billions by the corrupt cabal behind Nigeria’s current woes. Not selling off 10 presidential jets inherited from his predecessor has not made Nigerians happy with president Buhari. The cost for maintenance of this exorbitant air fleet; the most elaborate in Africa and indeed many nations across the entire world, runs into the millions of dollars yearly… several millions would be recovered if most of these jets were sold off. The Punch put the cost over the past 15 months at 5 billion naira; that’s about 16 million dollars at the current bank exchange rate. It was expected that upon entering office, one of the first actions of “Mr. Integrity” as Buhari was called, would be to sell off the opulent fleet. It did not happen. While Buhari’s policies appear to put Nigerians in chains, stripping the poor masses and small businesses of equal opportunity while taxing them further on every utility – with fuel price hikes, bank stamp duty and other central bank racket charges, road use and phone data charges being prepared – the cabal have not been asked to change, as they continue to benefit from the chronically embedded oligopolistic system. The strongly criticized sudden import bans to allegedly “restrict Forex” continue a historic trend of masses-enslaving and impoverishing, politics-based promotion of cabal-industry over small businesses. Obasanjo and Dangote are back in power through the APC, dishing out policies that will help the many cabal reported to be secret investors in Dangote’s business to continue to amass billions while cementing Nigerians in poverty. 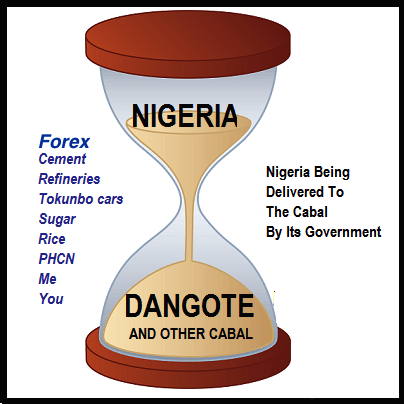 A recent report by Reuters accused the Buhari government of literally gifting Africa’s richest man and the king Cabal, Aliko Dangote $100 million in just three months reviewed in released central bank reports. That would equal as much as a whopping half a billion dollars that Dangote alone could have received in foreign currency advantages given by the Buhari regime in a 12 month period. Small businesses, Nigeria’s largest employers (employing 75% labor) were treated the opposite. They were put in chains. Change certainly does not begin with Dangote who is known to receive such delicious perks from all parties in government and to return favor by sponsoring the political campaigns of all sides. The remaining disbursement of half-price government subsidized dollars through Buhari’s first year in office has not been completely scrutinized but it can easily be extrapolated that other cabal likewise got juicy allocations running into billions of dollars in free cash gifts from the Godwin Emefiele-led Nigerian central bank while tens of thousands of small businesses were abandoned to collapse and Nigerians were forced to chain their pots.